The ocean is just 30 minutes over the mountain from our cabin in the woods, and we love going for afternoon trips to Pescadero. One of my favorite stops is the Harley Goat Farm, where they have the most amazing cheese shop (and you can pet the baby goats!). 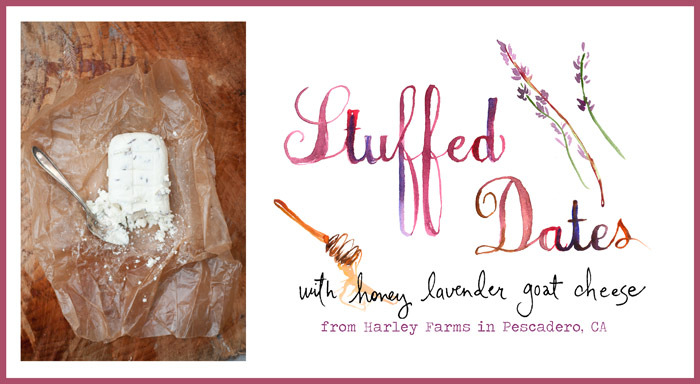 On a recent visit we picked up some honey lavender chevre (available online) and stuffed it inside big sweet dates for a cocktail hour treat. For more of my day trips and summer adventures, follow me on Instagram, @theforestfeast. Cheers!